Measurements: 2.6 x 4.7 inches, or 67 x 120 mm. Back of card: I think it's a very ornate fleur-de-lys, though you might not see it quite like that. White flower on a green field with white borders. May be inverted. Booklet included: Yes, in the form of a folded sheet of paper. Sixteen panes to the sheet (counting front & back), each pane measures 2.7 x 4.8 inches, or 68 x 121 mm. 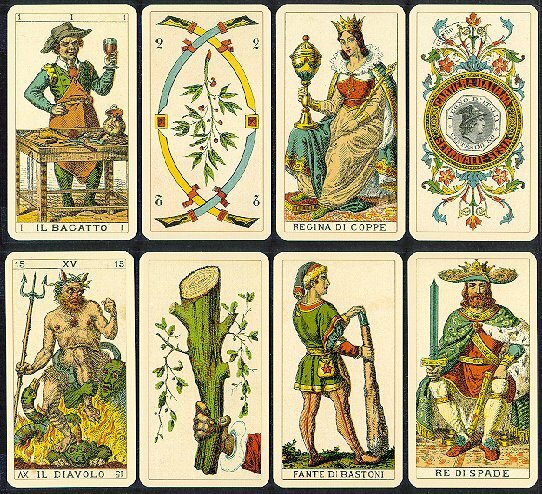 Comments: One of a series of historic Italian tarot decks. On the box, this one says, "Cartiera Italiana in Serravalle Sesia 1880". My Italian isn't quite good enough to tell you exactly what that means, but you get the idea. Another in a series of "Marseilles" type decks. Unlike the US Games reproductions, Lo Scarabeo's old decks are not as old & they never give notes on the origins of the decks. This appears to be one of a series of late 19th century commerical decks. Enjoy.